Villa Portole Uno is a delightfully pretty stone-built detached villa with private swimming pool, ideally located in the heart of Italy between the famous town of Cortona in Tuscany and the pictoresque Lake Trasimeno. With 3 air-conditioned bedrooms, 3 bathrooms, large common areas, panoramic views and generously sized swimming pool reserved for the exclusive use of the guests, this property is the ideal choice for an unforgettable yet inexpensive holiday in Italy. Villa Portole Uno is just 500m away from the tiny hamlet of Portole, with a food shop and excellent restaurant, and just a 10 minutes' drive away from Cortona with its beautiful walled Medieval center. For the swimming and sunbathing lovers, the well known Lake Trasimeno is 15km away. Inside the villa is set over 2 floors, and features beautiful terraces perfect for al-fresco living. On the ground there is a welcoming living room with satellite TV (free channels), music system and comfortable sofas. An arch made of traditional Tuscan bricks leads to the dining area with fully equipped kitchen (cooker, oven, fridge, freezer, dishwasher, toaster, orange squeezer, kettle). On the ground floor there are also a shower room and a laundry room with washing machine. A staircase leads up to the first floor, housing 3 welcoming and carefully furnished bedrooms, 2 bathrooms and an inviting covered terrace. The master bedroom, with double bed, has its own shower room. While the 2 further bedrooms are twins (the beds can be joined on request) and share a family shower room. Air-conditioning is available in all the bedrooms (with individual control). Outside Villa Portole Uno offers a beautiful and generously sized private pool, reserved for the exclusive use of the guests. The pool measures 10m x 5 m, maximum depth is 2,45m and it is open from 28 April to 30 October. Beautiful views, barbecue, sunbeds, parasols, playground for children and outdoor dining facilities complete the setting. Welcome to Villa Portole Uno, the perfect choice for a Tuscan holiday! 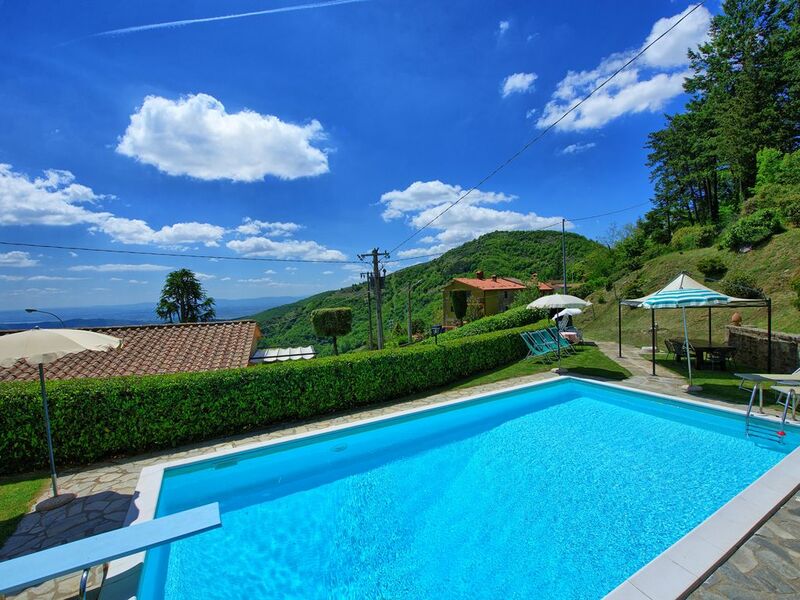 Beautiful, comfortable and well-equipped villa with a fantastic view over the valley. Had a great week in this beautiful villa. It had absolutely everything we needed and was spotlessly clean. The villa has stunning views and the pool was perfect! There was a restaurant within walking distance and a lovely forest walk behind the villa. It was about 20 minute drive to Cortona where there are lots of restaurants. All in all a great experience and the owners live very close by. They were very helpful and gave us lovely fresh eggs, cakes and a bottle of local wine. Would definitely recommend. Visited Portole Uno for one week in June 2018. Very beautiful scenery. The house is also good. Three bed- and bathrooms. Slightly dark from inside but everything works. As the house is 15 min up from Cortona it was around 5 degrees colder than on the bottom of the valley. Smiling Anna (the other lady-only italy speaking) was hearty. The road is just beside the house but it didnot bother us. Not much traffic. In September 2017 we spent a week at Portole 1, the house was very clean and the pool area very well tended. Cortona is less than 10 km away, it is such a fantastic town to explore. The price in September was a real bargain for our group of 4 people. The road that passes by the house is not very busy at all. Absolutely recommended. The hills surrounding Cortona are a heaven of peace and tranquillity. And it is on this hills, by the tiny hamlet of Portole, that Villa Portole Uno is located. Providing sensational views over the rolling hills and the Trasimeno Lake (with swimming opportunities), the villa is also within easy reach of the historical center of Cortona with its alleys, excellent restaurants and bars. The relaxing location, together with the close proximity to amazing places of interest, turn Villa Portole Uno into the perfect base to live a truly Tuscany holiday.